The future update to the iOS operating system that operates the iPhone, iPad, and iPod touch is already under development at Apple's headquarters in California. There has been a major change in Apple’s development policy since the inception of ios 12, and its developers now have more freedom to push back features that aren't ready when necessary. Apple has already planned out the next two years of updates at the same time. They are now allowing under-developed features to be delayed at the same releasing yearly updates. For that reason, the iOS 13 update is supposed to be more developed than the prior updates, at the same time, there are possibilities that any rumored feature could be postponed too. There are a few things about iOS 13 that we already know because Apple delayed features in iOS 12 to iOS 13 to keep its focus on bug fixes and other under-the-hood improvements. Majority of these features were shared by Bloomberg. It can be expected that a redesigned Home screen interface, improvements to Photos, iPad specific updates, cross-platform iOS, and Mac apps, and more, are supposed to roll out along with iOS 13. Let's get into the details now. iOS 13 will feature a dark mode for the first time, it's one of the features iOS users have desired for quite some time now. The dark mode will probably replicate the dark mode that was first introduced on macOS Mojave which will help user during night-time viewing. Rumors are there that Apple is planning to double the length of the video that's attached to a Live Photo. The duration will now be 6 seconds instead of 3. There is also buzz about Apple is working on a new Home screen for the iPhone and the iPad, but we don't know exactly what it will look like until further information is rolled out from the company's end. CarPlay, a leading iOS app is also expected to get a new Home screen to match the iOS 13. We do have a few details about what the revamped files app would look like, but Apple has stated that it is still working on some new features to be added to the new version of the app. Many of the important features of the new iOS 13 be believed to focused to help the iPad users. Apple is supposed to be rolling out an important feature which will enable displaying multiple windows in a single iPad app using a tab view. A multitasking feature for displaying two windows of the same app side by side is also under iOS development. There are also speculations that the mail is also going to receive new features. Rumors are their users will be able to mute incoming mail notifications from specific email threads once the update is rolled out. The iOS 12 and macOS Mojave have helped to introduce a new framework for integrating iOS apps to the MacOS, To test it, several iOS-only Apple apps, such as Stocks, Home, and Voice Memos, were ported to macOS to check their stability. In iOS 13 and macOS 10.15, Apple has planned to expand this functionality to developers, so that it will be easier for iOS apps to be tweaked for porting to the Mac. New emoji won't be instantly available after the launch of iOS 13, but we can expect it to be introduced within an iOS 13 update later in 2019. 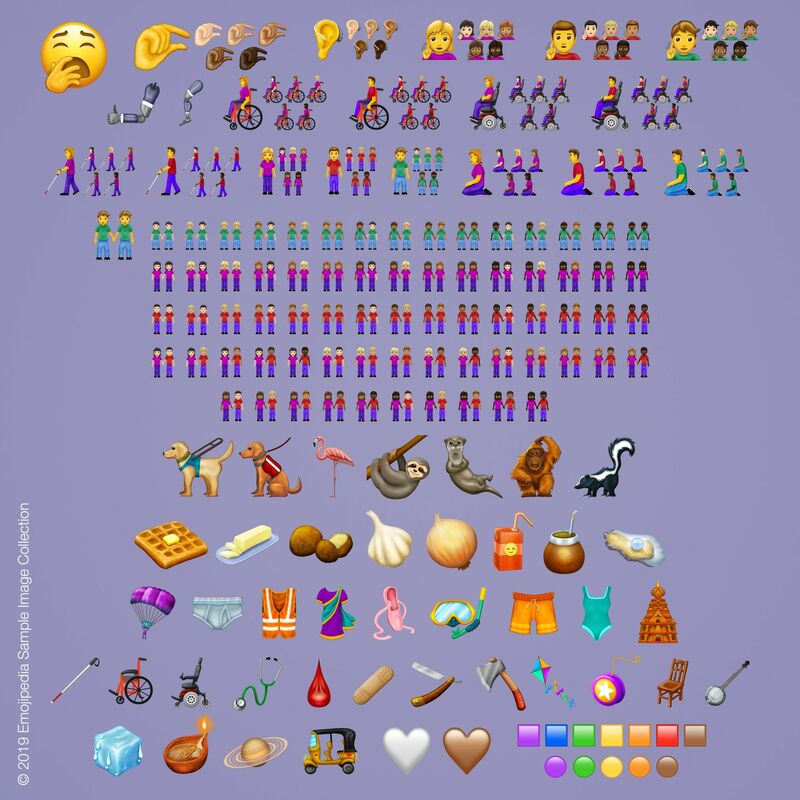 This update will introduce a few new characters to the emoji library. The characters which are to be added have been finalized by the Unicode Consortium. Some of them are named, flamingo, otter, waffle, sloth, white heart, people holding hands, ice cube, snorkel, orangutan, juice box, falafel and many more. The iOS 13 is already under development at Apple's Cupertino campuses, and user visits to the MacRumors website from devices running iOS 13 with Apple IP addresses have already picked up over the last few months. The visits actually began in early 2018 and have increased over the holiday months. Apple is known to start working on new versions of iOS many months in advance, and as a June preview date approaches near, we expect to see a growing trend of visits from iOS 13 devices. iOS 13 is all set to be previewed at the Worldwide Developers Conference, which is scheduled to take place at some point in June. Exact dates for the event are yet to be shared. After the iOS 13 is unveiled at WWDC, it will be available to developers for testing purposes, Apple's public beta testing group will follow after that. Once beta testing has been completed, iOS 13 is supposed to see a public release alongside new iPhones, provided Apple sticks to its traditional release schedule. Self-published writers are especially looking for creative and free book marketing methods. website if you’re opting for an internet book of photos. You possibly can make utilization of clothes along with adornments to produce customized styles. And if you’re going to utilize it daily, you want that it is attractive. Therefore, look closely at its alignment with the rest of the furniture in there. you’ll find a good amount of new lounge tables to pick from. Today anyone has an iOS phone. iPads are so widespread that this has led to developing a millions of applications that provide servises such as mobile games, entertainment playgrounds and others. To download any of these apps a user must get an account at Apple Store. But not all applications are available there as they don’t meet the Apple rules. To combat this a new app was developed called TutuApp. This helper works on iOS run phones and it has the biggest store of apps. We name a few: Clash of Clans, Pokemon and many others. They come with zero ads and locked content! Whant to know more? Visit TutuApp iOs Free to download Tutu App for free on your iOS device. Installation instructions for TutuApp Helper are available at that page.